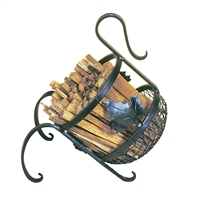 Minuteman fatwood caddy FWC-30 is a twisted rope design. Measures 6 3/4" Diameter x 5 1/2" High. Comes with fatwood as shown. Graphite powder coated. Minuteman fatwood caddy FWC-03 offers a European design. Measures 12" W x 12" D x 14" H. Comes with fatwood as shown. Graphite powder coated. 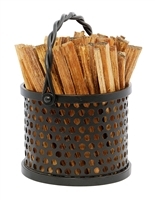 Minuteman wood holders are rugged and reliable. WDH-18 is made of wrought iron. Painted black. 16" W x 12" D x 22" H. Minor assembly required. 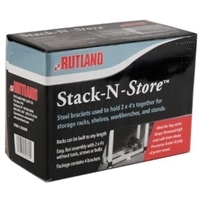 Minuteman wood holders are rugged and reliable. WDH-24 is made of wrought iron. Painted black. 24" W x 12" D x 22" H. Minor assembly required. 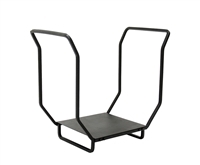 Minuteman wood holders are rugged and reliable. WDH-36 is made of wrought iron. Painted black. 36 3/4" W x 11 3/4" D x 19 3/4" H. Minor assembly required. 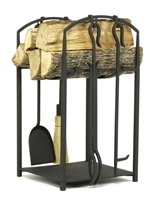 Our favorite Minuteman wood holder with essential fireplace tools; poker, shovel, broom, and tongs. Graphite powdercoated. Ships assembled. 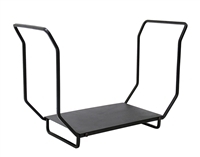 23" W x 11 1/2" D x 30" H; Tools: 25"L Steel shelf at bottom for newspapers or kindling.